It feels good and very fulfilling when you return from a mission with a very tangible take-away. In the case of my recently concluded Jakarta trip, my take-away was a book and, less tangible but equally important, the insights it gave me about our regional work in East Asia. While on the plane, I read and finished the book I got from a meeting with the ASEAN Secretariat. Entitled "Narrowing the Development Gap in ASEAN: Driver and Policy Options", by Mark McGillivray and David Carpenter. The book presents a clear picture of where the countries are in various aspects of development and how they, together as a region, can help each other achieve inclusive development. 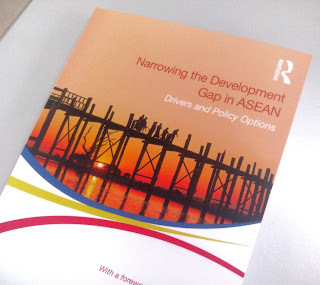 Even for people who are not familiar with ASEAN, the book is informative and eye-opening. It allows one to take a regional view and go beyond individual country concerns. It clearly articulates – in practical terms – the regional development discourse of ASEAN and points to sensible policy options. The options presented in the book hold true for all ASEAN member countries, despite the fact that the book deals with narrowing the development gap between two sets of countries: first, the four countries that are currently facing a myriad of development challenges, and second, the six others, which are relatively more advanced in development. The four countries are collectively called CLMV or Cambodia, Laos, Myanmar and Viet Nam. For a regional organization like ANSA–EAP, the book has an encouraging message on ways by which governance can drive ASEAN development. This hints at the relevance of the kind of advocacy work we do. "A clear theme running through this analysis is the importance of improving governance and institutional quality to more expeditiously narrow the gap." "ASEAN, countries, in particular the CLMV group, will need to continue to strive for improvements in each of these areas [accountability, transparency, rule of law, political stability, bureaucratic capability, property rights protection and contract enforcement, and control of corruption] if the development gap has to be reduced." ASEAN needs to address governance seriously because "all governance indicators for ASEAN countries have fallen between 1996 and 2010. There is generally a very clear gap between the ASEAN-6 and CLMV countries in many of these areas, with the exception of Vietnam, which ranks above Indonesia and the Philippines on some indicators." 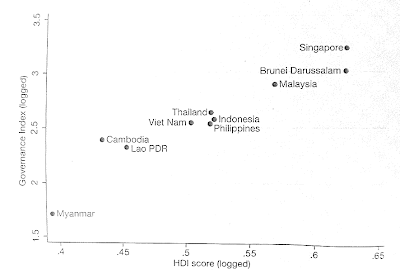 "[T]here is strong positive correlation between governance and institutional quality and economic growth and income level. Improved governance and institutional quality also lead to higher level of human capital development, which is a very important driver of development. The governance driver interacts with many of the other drivers to improve overall performance towards narrowing the development gap." The book is certainly a useful guide to navigate our program for the East Asia region. The recognition of governance as a driver of development is an important start. It is interesting to see how the concept of citizen participation will play out in the entire governance discourse of ASEAN and how mainstreaming of such practice among the civil servants of various countries will happen. If you ask me, the next book should be on this special issue.